OUR 4TH INSTALLATION IS INSTALLED! A lot has been going on in 2017 to improve Longview’s downtown. The most obvious was the final phase of the Streetscape beautification, only recently completed. Accenting this new clean look of our downtown the Longview Outdoor Gallery added eight new loaned sculptures in September. This brings the total to 20 pieces lining Commerce and Broadway. 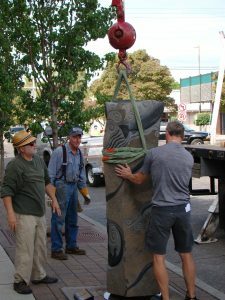 Some artwork like “Peace Totem” and “The Chase” literally weighed a ton and the City of Longview rose to the occasion, providing a crane and expert placement. Wonderful help from volunteers carried the day without a hitch, especially the welding services of Rainier’s Berkley Tack who has anchored all the sculptures over the past four installations. It was a great moment to expand the program to the next level. These high quality sculptures will stay in place for the next two years at which time at least one of them will join the others in the City’s permanent collection. THREE IN 2016 AND THREE MORE in 2017! 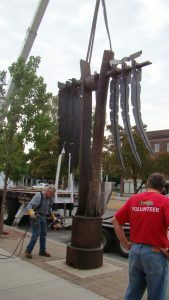 Our first exhibit of eleven sculptures was installed September 2011 along Commerce Avenue. Six of those have been purchased and are staying in town. Our second exhibit was installed September 2013. We raised enough funds to buy three more sculptures to donate to the City of Longview. Our third exhibit went up September 2015 with four new sculptures and three sculptures not purchased from previous exhibit. Our fourth exhibit is now installed with eight new sculptures! Go to https://www.surveymonkey.com/r/YMYPSX3 and vote for your favorite. See Photos on Current Exhibit Page. The Longview Outdoor Gallery program was inspired by the Visual Arts Commission trip to see the Puyallup, Washington outdoor gallery in 2009. A small task force started and has increased over the years. The City Council made a resolution to support the project and citizens and organizations have been supporting this important program. We know this program is fabulous for our community. It is revitalizing and beautifying our city’s living room space: the Downtown. It brings families, students, photographers, visitors as well as budding and successful artists. It opens imaginations, inspires creativity and provides fun activities. This list is unlimited in what we dream for this program. The 2nd stage of Longview Streetscape Improvement Project has been completed and new permanent locations for art are installed. We continue funding to purchase more sculptures. Your donation is needed to reach this goal. Also, all art is for sale. This project is owned by the community and will be solely funded by donations. Fundraising for this project will be ongoing and also so will grant applications. Our partnership with the Longview Public Service group will make all donations tax deductible according to IRS guidelines for 501 (c) (3).